North Manatee RV and Boat Storage is Manatee County’s foremost vehicle storage facility, with 15 acres of SECURE SPACE for all your storage needs. 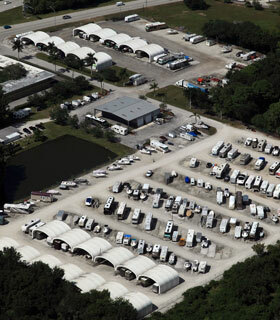 Our facility offers both open and covered storage for your RV, boat, or trailer. We have over 400 spaces to accommodate you! For details on amenities and pricing, see our Services page. *See the map of our service area. And because we are situated between the Manatee River and Terra Ceia Bay, our location allows easy and quick access to the Gulf of Mexico for boating and fishing. The Sunshine Skyway Bridge is just minutes away. Boat ramps are located nearby in Palmetto and Terra Ceia. Storage contracts are available for monthly, quarterly, or yearly rental of your storage space.